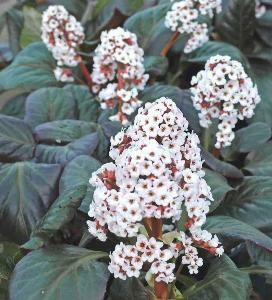 Bergenia 'Bach' is a very neat plant with lovely glossy red flushed foliage in the winter. In March - May the plant produces huge heads of pale sugary pink flowers which turn white as they mature. Well drained soil in sun or partial shade. Height 40 cm.